At the Social and Affective Neuroscience Society 2016 Conference, New York, NY. Crafa, D., Stoddart, C.M., Makowski, C., Lepage, M., & Brodeur, M.B. (2018, April). The impressionable social self of schizophrenia: Neural correlates of self-other confusion after social interaction. Special merit-based honor: #1 spotlight presentation given by special invitation at the annual meeting of the Society for Affective Science (SAS), Los Angeles, California, USA. Crafa, D., Huang, S.-H., & Stoddart, C.M. (2019, February). Determinants of autism rates in vulnerable international populations. Paper accepted for presentation at the annual meeting of the Society for Cross-Cultural Research (SCCR), Jacksonville, Florida, USA. Casio, A., Crafa, D., & Racine, E. (2018, November). Entanglements of care in autism services in Europe and North America. Paper presented at the annual meeting of the American Anthropological Association Annual (AAA), San Jose, California, USA. Crafa, D., Stoddart, C.M., Makowski, C., Lepage, M., & Brodeur, M.B. (2018, October). Representations of the self by patients with schizophrenia after social interaction: cultural and clinical implications. Paper presented at the 5th World Congress of the World Association for Cultural Psychiatry (WACP), New York, New York. Crafa, D., Stoddart, C.M., Makowski, C., & Brodeur, M.B. (2018, July). Changes in self-identity and related brain processes after social interaction. Paper presented at International Congress of the International Association for Cross-Cultural Psychology (IACCP), Guelph, Canada. Görlitz, K., Crafa, D., Lepage, M., & Brodeur, M.B. (2018, June). Difficulty interpreting facial expressions in and out of context corresponds with atypical N250 response in schizophrenia. Paper accepted for presentation at the annual meeting of Synapsium, Nijmegen, Netherlands. Crafa, D., Schiff, J., & Brodeur, M.B. (2018, April). Social interaction alters self identity in healthy populations and differently in patients. Paper presented at the annual meeting of the Society for Affective Science (SAS), Los Angeles, California, USA. Crafa, D. (2017, March). Epigenetic and socio-environmental factors influencing autism risk for children from migrant families. Paper presented in the Symposium Politics of the Life Course: Practicing Development from Individual to Social at the biennial meeting of the Society for Psychological Anthropology (SPA), New Orleans, Louisiana, USA. Crafa, D., & Brodeur, M.B. (2017, March). Social interactions modulates self-identity: Evidence from human behavior and brain imaging. Paper accepted for presentation in the Symposium: Cognition, Brain Imaging, and Culture at the annual meeting of the Society for Cross-Cultural Research (SCCR), New Orleans, Louisiana, USA. Crafa, D., Stoddart, C., & Brodeur, M.B. (2016, August). Social interaction modulates self-construal: A discussion of behavioral and fMRI evidence. Paper accepted for presentation at the 23rd Congress of the International Association for Cross-Cultural Psychology (IACCP), Nagoya, Japan. Crafa, D., Schiff, J., He, V., Gu, L., Stoddart, C.M., & Brodeur, M.B. (2016, June). The dynamic social self: Social interaction alters self-construal. Paper presented in the Symposium: International Perspectives on Social Identity Flexibility, Responses to Social Change and New Immigrants, and Conducting Ethical Research at the 77th Annual Congress Canadian Psychological Association (CPA), Victoria, British Columbia, Canada. Crafa, D., Schiff, J., He, V., Stoddart, C., Gu, L., & Brodeur, M.B. (2016, February). Social interaction mediated by cultural identity alters self-construal. Paper presented at the annual meeting of the Society for Cross-Cultural Research (SCCR), Portland, Oregon, USA. Crafa, D., Agostini, A., Stoddart, C., Senju, A., & Venuti, P. (2015, October). Culture influences eye contact behaviors of autistic and control children: A comparison of Italian and Japanese boys. Paper accepted for presentation at the 4th World Congress of the World Association of Cultural Psychiatry (WACP): Global Challenges & Cultural Psychiatry, Puerto Vallarta, Jalisco, Mexico. Crafa, D. (2015, July). Controlling for controls: Relative differences between patients and controls may vary across cultures. Paper accepted for presentation at the Regional Meeting of the International Association for Cross-Cultural Psychology (IACCP), San Cristobal, Chiapas, Mexico. Crafa, D., Schiff, J., Stoddart, C., & Brodeur, M.B. (2015, June). Social interactions influence individual self-construal. Paper presented at the annual meeting of Cognitio, Atypical Minds: the Cognitive Science of Difference and Potentialities, Montreal, Quebec, Canada. Pineda, J., Crafa, D., & Brodeur, M.B. (2015, June). The effects of context on facial emotion recognition. Paper presented at the annual meeting of Cognitio, Atypical Minds: the Cognitive Science of Difference and Potentialities, Montreal, Quebec, Canada. Sanon, P. Gu, L., Crafa, D., & Brodeur, M.B. (2015, June). The influence of context on ambiguous emotion perception. Paper presented at the annual meeting of Cognitio, Atypical Minds: the Cognitive Science of Difference and Potentialities, Montreal, Quebec, Canada. Crafa, D. (2014, June). Representing human cultural and biological diversity: Why and how. Paper accepted for presentation at International Congress of the International Association for Cross-Cultural Psychology (IACCP), Reims, France. Crafa, D. (2014, March). Cross-cultural beliefs about agency: Behavioral pilot for an fMRI study. Paper accepted for presentation at the Foundation for Psychosocial Research (FPR) Workshop, Montreal, Quebec, Canada. Caruso-Anderson, M., Crafa, D., Pauls, A., Eachus, T., & Hagopian, L. (2013, May). Social preference and interaction assessment: Implications for the social phenotype. Paper presented at the 39th Annual Convention for Behavior Analysis International, Minneapolis, MN. Kärtner, J., Crafa, D., Chaudary, N., Keller, H. (2013, April). What do you do if you get a present? Co-regulation of social behavior in mother-child interaction in Berlin and Delhi. Paper accepted for presentation at the Society for Research in Child Development (SRCD) Biennial Meeting, Seattle, Washington, USA. Kärtner, J., Crafa, D., Keller, H. (2012, September). “Ein Klavier, ein Klavier” - Geteilte Geschenkfreude im 2. Lebensjahr bei Mutter-Kind Dyaden in Berlin und Delhi” [“A piano, a piano”: the shared joy of gift-receiving during the second year of life in mother-child dyads in Berlin and Delhi]. Paper presented at Kongress der Deutschen Gesellschaft für Psychologie [Congress of the German Society for Psychology], Bielefeld, Germany. Crafa, D., & Nagel, S. (2012, July). Whole-patient applications of neuroscience for cross-cultural psychiatry: taking a systems approach to transnational clinical care. Paper presented at International Congress of the International Association for Cross-Cultural Psychology (IACCP), Stellenbosch, South Africa. Crafa, D., Koß H., & Preuß K. (2011, October). Social behaviors in autism and fragile X syndrome. Paper presented at the annual meeting of Interessengemeinschaft Fragiles-X e.V. [National Fragile-X Community Association], Bad Salzschlirf, Germany. Crafa, D., & Quirin, M. (2011, August). Self-determination modulates the cortisol awakening response (CAR) and mediates its effects on mental health. Paper presented at the annual meeting of the International Society of Psychoneuroendocrinology (ISPNE), Berlin, Germany. Anderson, M.A., Crafa, D., Rooker, G., Hagopian, L., Kaufmann, W.E., & Kagan J. (2011, May). Social withdrawal in fragile-X and autism spectrum disorders. Paper presented at the annual meeting of Applied Behavioral Analysis (ABA), Washington, DC, USA. Crafa, D. (2006, September). Judeo-Christian themes in The Selfish Gene and Dawkins’s reinterpretation of human morality. Paper presented at the annual meeting of American Philosophical Association (APA), Washington, DC, USA. Crafa, D. (2006, July). Revaluation of reflection: the influence of therapy on the individual in contemporary American society. Paper presented at the annual meeting of the Consciousness, Self-Consciousness, and Cultural Identity Conference, Kolkata, India. Crafa, D. (2004). Nietzschean critique of evolutionary psychology: current theories of human moral development. Paper presented at the annual meeting of National Conference for Undergraduate Research (NCUR), Indianapolis, Indiana, USA. Crafa, D., & Brodeur, M.B. (2019, May). Social interaction alters representations of the self by patients with schizophrenia: A cross-cultural EEG study. Paper accepted for presentation at the annual conference of the Social and Affective Neuroscience Society (SANS), Miami, Florida, USA. Wu, X., Crafa, D., & Brodeur, M.B. (2018, October). Vertical cultural transmission and schizophrenia: the first step towards understanding the relationship between culture and schizophrenia. Poster presented at the 5th World Congress of the World Association for Cultural Psychiatry (WACP), New York, New York. Crafa, D., Stoddart, C.M., Makowski, C., & Brodeur, M.B. (2018, April). Social interaction alters neural representations of self-identity: Evidence of neural precursors to social learning. Poster presented at the annual meeting of the Society for Affective Science (SAS), Los Angeles, California, USA. Crafa, D., Stoddart, C.M., Makowski, C., Lepage, M., & Brodeur, M.B. (2018, April). The impressionable social self of schizophrenia: Neural correlates of self-other confusion after social interaction. Poster presented at the annual meeting of the Society for Affective Science (SAS), Los Angeles, California, USA. Crafa, D., Stoddart, C.M., Shen, A., Liang, G.Z., & Brodeur, M.B. (2016, April). Flexible behavioral and neural responses to social interaction: A comparison of Chinese and Canadian cohorts. Poster presented at the annual conference of the Social and Affective Neuroscience Society (SANS), New York, New York, USA. Voorhies, W., Stoddart, C., Liang, G.Z., Crafa, D., & Brodeur, M.B. (2016, April). Flexible neural responses to changes in social context during emotion interpretation. Poster presented at the annual conference of the Social and Affective Neuroscience Society (SANS), New York, New York, USA. Voorhies, W., Stoddart, C.M., Liang, G.Z., Crafa, D., & Brodeur, M.B. (2016, January). New social information produces flexible ERP responses during emotion interpretation. Poster presented at the 8th Quebec Bio-Imaging Network (QBIN) Scientific Day, Montreal, Quebec, Canada. El-Said, D., Shen, A., Voorhies, W., Crafa, D., & Brodeur, M.B. (2016, January). Changes in ERP amplitude in response to repetitive emotionally salient faces. Poster presented at the 8th Quebec Bio-Imaging Network (QBIN) Scientific Day, Montreal, Quebec, Canada. Stoddart, C.M., Liang, G.Z., Crafa., D., & Brodeur, M.B. (2015, November). The effects of different social schemas on the interpretation of facial emotions. Poster presented at the annual conference of NeuroQAM, Montreal, McGill, Canada. Voorhies, W., Stoddart, C.M., Liang, G.Z., Crafa., D., & Brodeur, M.B. (2015, November). Flexible neural responses to new social information during emotion interpretation. Poster presented at the annual conference of NeuroQAM, Montreal, McGill, Canada. Shen, A., He., V., Schiff, J., Stoddart, C.M., Crafa, D., & Brodeur, M.B. (2015, November). Flexible responses to human social interaction across cultural groups. Poster presented at the annual conference of NeuroQAM, Montreal, McGill, Canada. El-Said, D., Shen, A., Voorhies, W., Crafa, D., & Brodeur, M.B. (2015, November). Modulation of ERP amplitude as a result of repetitive emotionally salient stimuli. Poster presented at the annual conference of NeuroQAM, Montreal, McGill, Canada. Crafa, D. & Nagel, S.K. (2015, April). Toward diversity in neuropsychiatry. Poster presented at the Montreal Neuroethics Conference for Young Researchers, Montreal, Quebec, Canada. Sanon, P.N., Gu, L., Crafa, D., & Brodeur, M.B. (2014, September). The effect of contexts in the interpretation of the others’ feelings. 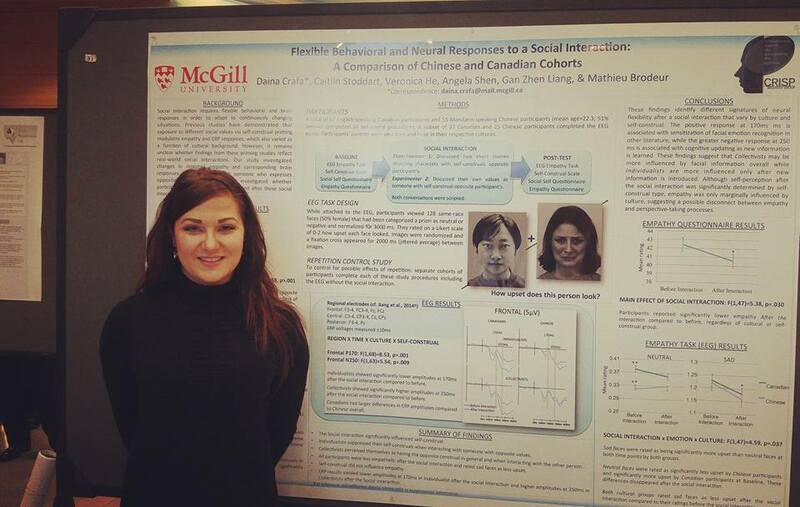 Poster presented at the annual McGill Graduate Student Retreat, Montreal, Quebec, Canada. Crafa, D., & Warfa, N. (2014, May). Maternal migration, epigenetic changes, and autism risk. Poster accepted for presentation at the annual meeting of the International Cultural Neuroscience Consortium (ICNC), Ann Arbor, MI, USA. Crafa, D., & Warfa, N. (2014, April). Environment, epigenetic changes, and autism post-maternal migration. Poster accepted for presentation at the annual conference of the Society of Biological Psychiatry (SOBP), New York, NY, USA. Sanon, P.N., Gu, L., Crafa, D., & Brodeur, M.B. (2014, April). L'effet des contextes dans l'interprétation des émotions d'autrui. Poster presented at the 8th annual meeting of the Journée Scientifique, Montreal, QC, Canada. Crafa, D. (2013, September). Transcultural neuropsychiatry: Considerations for clinical research and the RDoC. Poster presented at the annual McGill Graduate Student Retreat, Montreal, Quebec, Canada. Crafa, D., & Nagel, S. (2013, June). Cultural neuroscience: Strengths and pitfalls of the Neuro-Culture Interaction Model. Poster accepted for presentation at the Regional Meeting of the International Association for Cross-Cultural Psychology (IACCP), Los Angeles, CA, USA. Crafa, D., & Nagel, S. (2013, May). Accounting for Heterogeneity: The Culture-Brain-Behavior Interaction Model. Poster presented at the first meeting of the International Cultural Neuroscience Consortium (ICNC), Evanston, IL, USA. Wahn, B., Schwandt, J., Krüger, M., Aleksey, L., Crafa, D., & König, P. (2013, May). Attentional Benefits in a Visual Joint Search Task Through Tactile and Auditory Transmission of 2D Spatial Information. Poster accepted for presentation at the Annual Meeting of OCCAM, Osnabrück, Germany.